“And yet the manner of life customary among us has spread almost every where, and brought about a change for the worse, effeminacy, luxury, and over-great refinement, inducing extortion in ten thousand different ways…which may indeed appear to promote civility of manners, but do doubtless corrupt the morals and lead to dissimulation.” (Strabo: Geography. Transl. by Hamilton, 1854, p.462). Based on such a modernity, the West lost its way. Illnesses of civilization like greed, corruption, wars, alienation and narrow-mindedness have increased since then. Time is out of joint. All coherence has gone. There is no more time to wait since we have arrived now to planetary limits. This is why the fact that China has not been blinded by the successes and the failures of the West, and has decided to build up an ecological civilization is a welcome turn of historical importance. 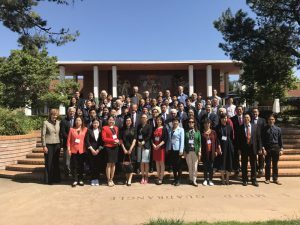 The 11th International Forum on Ecological Civilization, cosponsored by the Institute for Postmodern Development of China (IPDC), the Center for Process Studies (CPS) and Toward Ecological Civilization (Eco-Civ), was held on April 28-29 in Claremont, California and attracted more than 100 participants, mostly Chinese and Americans. Patrick Mason, Dean of the School of Arts and Humanities at Claremont Graduate University, has proposed to go beyond material self-interests, find deeper understanding and common solutions. Meijun Fan, one of the main organizers of the conference and the program director of IPDC as well as the co-director of the China Project of CPS, in her welcome remarks noted that we are in an endangered situation, but history has shown that consciously directing our life is of basic importance, and as even mountains cannot block the journey of rivers to the sea, the development of ecological civilization is on its way. Yuan Li, President of South China Institute of Environmental Science, Ministry of Environmental Protection, and Xiuyu Zhang, Vice Director of Center for Ecological Civilization at SCIES, pointed out in their plenary speech, entitled “Ecological and Community Shared Destiny,” that although there are a great many different interest groups, faiths, ideologies, and social systems in the world today, ecological civilization could help us all live together peacefully and reasonably, keeping in mind our common future since we and others—including the earth—are one organic community with a shared destiny. and ecological civilization is the most hopeful event on this planet. One factor of the current crisis could be that modernity alienates us from fully appreciating the communities of life we live in. In her talk, Mary Evelyn Tucker reexamined the western understanding of Confucian values of communitarian ethics and pointed out that a broader understanding that extends to cosmological foundations is necessary. The cosmological connection grounds one in communitarian ethics of self, society, and nature. Appreciating our life and mind as gifts of Heaven, we recognize a natural lead- ership regarding how to live our life and how to think with our mind in the natural context of the common good of the Cosmos, society, and family. We are in genealogical connection with the living Cosmos. Our cosmic genealogy holds great place among Confucian values; cosmic filiality was the basis of the Confucian system of values. This outlook is of primary importance for an ecological civilization. In her talk, Wang Ping, Founder and Chairperson of China Social Entrepreneur Foundation, proposed that we consider social values among the most fundamental values. The more social values made prominent and esteemed, the better our conditions to build a healthier future. Clifford Cobb pointed out that new cultural norms based on a constructive postmodern philosophy put modern thought in a new, critical, and long-term ecological context, one that incorporates the values of diversity and complexity and the importance of historically-rooted wisdom. Dr. Attila Grandpierre outlined a comprehensive scientific worldview based on the fundamental principle of the Universe, offering a postmodern science that may serve as one of the most powerful tools in building up the ecological civilization, the text of which can be found on his website: www.grandpierre.hu/site/ wp-content/uploads/2012/09/GrandpierreEcoCiv.pdf. civilization in China. The construction of an “Ecological Civiliz- ation” has been in the Constitution of China since 2012. Sharon Snowiss, Professor of Political Studies at Pitzer College and CGU argued in her speech that our picture about Nature as a whole determines our picture about mankind and society. This means that the whole precedes the part in regards to the most fundamental questions. Dr. Zhihe Wang, director of IPDC, and director of the China Project of CPS, pointed out that all of us can change the world. We do not have to wait for others, or government actions, because everybody can do something: change himself for the better, develop an ecological lifestyle and contribute to smaller or larger communities. He noted that nowadays 7 million students graduate college every year, and nearly half of those graduates fail to find the kind of job they thought they would find. Consequently they do not know what to do and lose direction in life. Moreover, the number of divorces increases. He suggested “Tongren education” instead of the American model of a “value free” education is needed—an education of cultivating students’ ability to break through barriers, to communicate with others, to get through the great wall separating learning from life, in order to nurture and transform students’ lives and thus to nurture and transform society. “Tong” here refers to establishing deep connections with nature, with society, with practice, with tradition, and with others. Tongren education is an integrative education, an education of becoming human, a compassionate education, whose aim is to cultivate problem solvers as well as empathic persons. Jay McDaniel shed important light to the human side of the ecological civilization. Modernity conceptualized our mind as pure intellect lacking emotions. Such a move alienates ourselves from our own personal and natural identity. Studies of embodied minds have shown that thinking includes emotion, intuition, imagination and empathy. We need emotional intelligence, spiritual literacy and sensitivity in order to live our life as healthy, non-alienated human beings. These constructive postmodern skills are developed most effectively from early childhood within our families; such education lasts a lifetime. He Xianglin and Jiang Li from Hubei University, China, reported that in 2015, China decided to make the values of ecological civilization become mainstream. Ecological civilization is defined, in short, as controlling the relationship between the population, resources and environment in a moderate range to keep society developing in a healthy, orderly and sustainable way. The four levels of these mainstream values are, in respect to their priority order, truth seeking (top value), resources saving and environment protection, green economy, and, fourthly, ecological excellence and sustainable development. The ancient traditions of each of China’s nationalities include highly useful knowledge and wisdom helpful for building an ecological civilization. As Zhou Hong from Yunnan University, China, mentioned, almost all ethnic groups have the tradition of deeply adoring Nature, of revering life as a kind of original religion standardizing human behavior. This is also important in protecting biodiversity. Unilateral liberalism that ignores vital long-term interests and values endangers our common future. Learning from ancient wisdom may be very helpful. In Sandu Shuizu autonomous county of Guizhou province, according to the village rules, any villager who cuts the trees in Fengshui Forest will be fined 100 RMB yuan, 100 kg of meat, and 100 days of work as a forest guard. This can be understood as an ecological obligation and ecological justice. Ancient wisdom differs from modern “value- neutral” knowledge, which can usually serve harmful aims at least as much as good ones, in that it teaches us that all knowledge should be utilized for the sake of life, humanity and Nature. Philip Clayton has worked out the theory of the Common Good Principle stating that political power should be used for the good of society to secure consistency with long-term needs of life on this planet. In this regard, too, it is worthwhile to keep in mind the wisdom of some of the Native peoples in North America: act today such that the seventh generation after you (your great- great-great-great-great grandchildren) will prosper. Our best interests and values are the ones that make our life more meaningful, joyful, and good, and all these connect us with the community of all life. Even as individual persons it is better, healthier, and more beneficial for us to develop harmony with our communities and Nature. Organic thought understands our life as profoundly intertwined with Nature, rich in reciprocal relations. As Jia Weilie enlightened us, the idea of “sustainable devel- opment,” when conceived within the conceptual framework of modernity, is a mistaken attempt to amend the old-fashioned industrial civilization that should instead be replaced by green development as conceived within the conceptual framework of ecological civilization. Only such an ecological green development can guide us towards the long-term harmony of civilization and Nature as a primary commitment. In her closing speech, Meijun Fan called attention to the importance of keeping practice and vision in balance. When someone gets too much into practice, the vision may be lost. We need profound vision to serve as a long-term guiding principle in our daily activities, otherwise we may get lost, as so frequently occurs in societies dominated by modernity. Attila Grandpierre, Ph. D., astrophysicist is the retired senior research fellow of Konkoly Observatory of the Hungarian Academy of Sciences, working on the comprehensive scientific foundation for the ecological civilization; he is also a musician, writer and speaker.